1967 Alfa Romeo Giulia TI Owner's Manual. 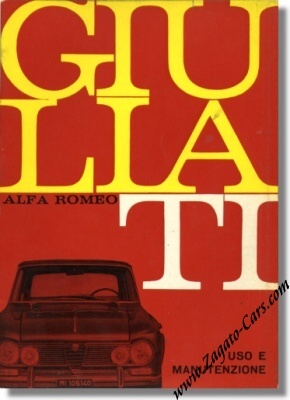 Vintage January 1967 owners manual for the Alfa Romeo Giulia 1600 ti. This is the third edition of this manual. It measures some 6 x 8 inches or 15 x 20 cm and counts 72 pages. Print reference: N. 995-1-67-(10000) R3, printed by Bertieri, Milano, Italy. The price includes shipping to any destination in the world !